Reuters has announced the launch of Reuters Live Stream, an online service providing live video access to breaking and scheduled news events from around the world. The service was designed for easy integration with newsrooms, and puts editorial control in the hands of online publishers. 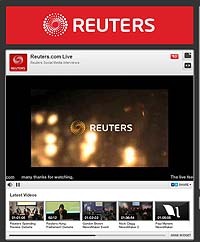 In an increasingly digital world, Reuters Live Stream provides a faster, cost-effective option to the traditional satellite news-gathering method. Video content is also compatible with mobile devices, including tablet technology. Reuters Live Stream is the newest component of the comprehensive coverage and delivery platform Reuters is building to meet the diverse needs of publishers and broadcasters around the world. It represents one additional step toward one stop fulfilment of our Reuters client needs worldwide. The Tribune Company, the second largest US publisher, and Fairfax Media, a leading Australian print and online media company, were the first to adopt Reuters Live Stream, which carried live coverage of the royal wedding.